Subconsciously I have started to write about entertainment related stuff on Fridays. Especially about watching movies online. If you feel squaemish about watching movies online in questionable sites, this post is for you. You can watch movies online for free, legally. Speedcine only includes feature length films (60 mins or longer) and no TV shows or shorts. Speedcine has around 16000 films in their database at the moment and are shooting for 25,000 title by the end of 2009. 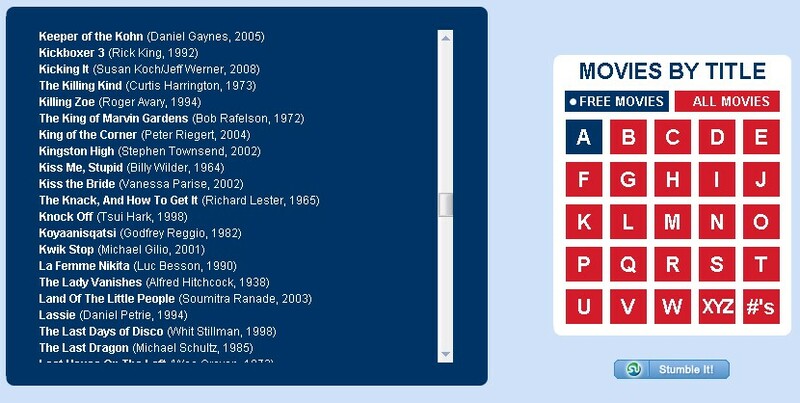 Speedcine lets you find movies either by searching by title or by scrolling their A-Z index. You can also filter just the free movies are look at all movies using the keyboard number pad like layout. Clicking on a movie title takes you to a page with links to places to watch a certain movie like Hulu (free), Amazon Video On Demand (paid). Speedcine’s motto is to keep its interface as simple as it is now. And that’s the reason you wont find movie ratings, cast, short intro, etc. Plus, they have affiliate partnership with different websites and that’s how they make their money keeping their site running. Next time you want to watch a movie online free and legally, check out SpeedCine.